As a traveler, I am asked what the best time to visit any country is and I find myself saying ‘During the festivals’. This time of the year is about celebrations in India starting with Durga Puja to Diwali and as a person who has spent her early years in Kolkata, I know a lot of it goes into Shopping. I have been shopping a lot on Myntra ever since it started. I love that I can evade the crowd during the festivals and shop from my laptop. Asymmetrical Kurtis: I love this design for how comfortable it looks .You can team it up with parallels/plain white trousers. If you have a good height, this would accentuate your height. I saw it in two colors (Blue and Yellow) and both of them are eye candies. Printed Short Kurti: Guys being a traveler, I love wearing Kurtis on Jeans for the ease of it. It also adds a touch of Indian-ness without going overboard. 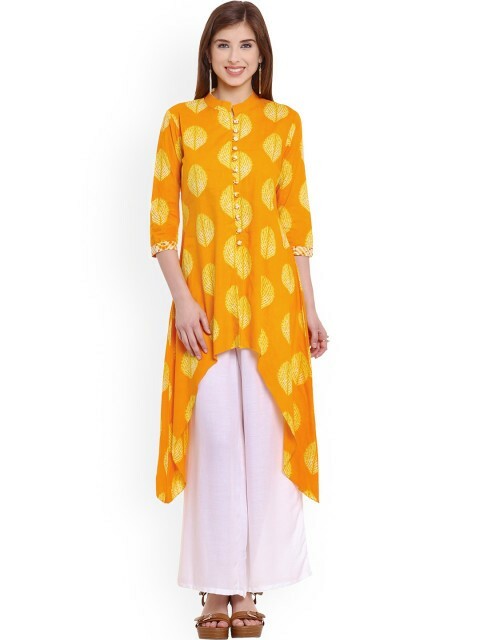 I love this short kurti because the details are taken care of, we see orange on our collars and on our sides. I think it’ll go well with white/blue jeans. Embroidered Kurta: We all know our families want us to look more traditional on such festivals than fusion wear. 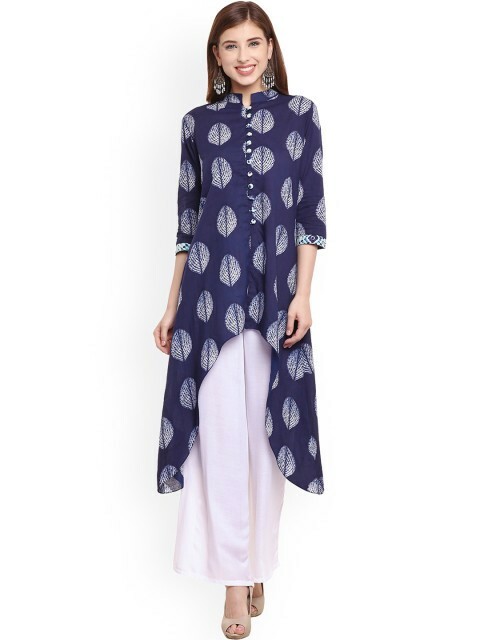 So this is a perfect kurta to wear to look elegant and modern. A little pricey but very beautiful. Exquisite Kurta: So this is a very unique Style which we usually see on ramp walks and we wonder where do we get them. I love this because, it is adorned with a beautiful spread of Aari work around neck and a asymmetrical hem. Questions sure are going to pop up on where you got it. 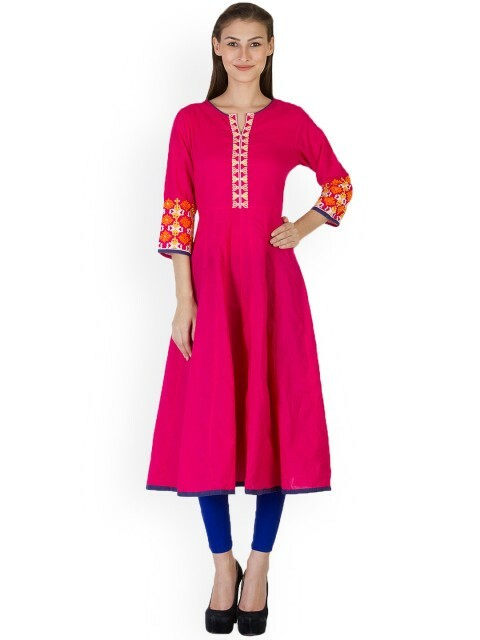 Bright Kurti with Mandarin Collar:This one reminds you of the Military Style pattern in front, and overall with the bright hues they look very presentable. Anarkali Kurta: Strike it with a legging and you are all set to go. Will go well in both daywear and evening wear. Color block Asymmetrical Kurti: I love this style for one reason if you don’t have a flat tummy, this is going to hide it perfect and look stylish and different. 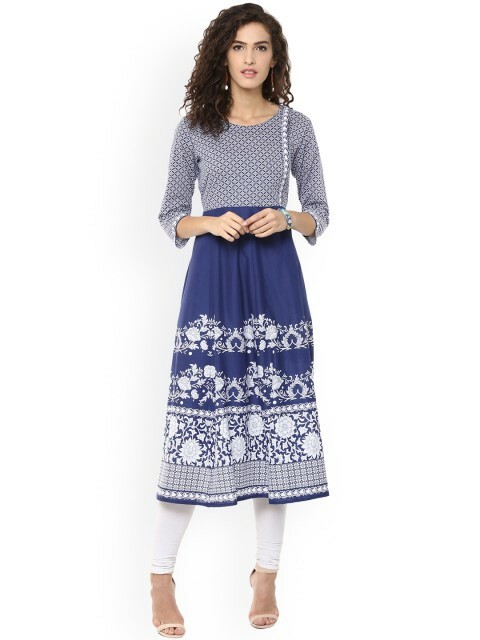 Anarkali Kurtis with Skirt: You can never get wrong with Fab India, can you? Look at this gorgeous ethnic kurti which goes so well with long flared skirt. Twist of Contemporary: Bright hues are always in trend with our Indian Sensibilities. This plain design with work would go well with leggings. Black Kurti: A lot of us love wearing black, this kurti is very comfortable and at the same time, very ethnic.